-5 D Lee (NZ); -4 G McDowell (NI), J Furyk (US); -3 J Rose (Eng), R Fowler (US). Selected others: -2 P Casey (Eng), L Westwood (Eng), I Poulter (Eng); E J Spieth (US). 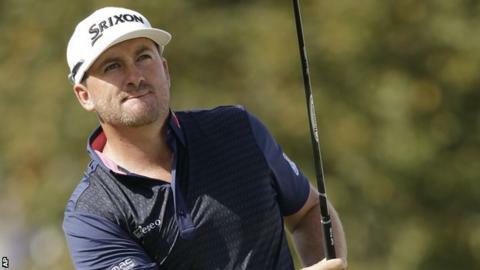 Graeme McDowell shot a four-under 66 to sit one stroke behind leader Danny Lee after the first round of the WGC-Bridgestone Invitational in Ohio. The Northern Irishman has struggled for form this season, managing just one top-10 finish - ninth at February's Dubai Desert Classic. But the 36-year-old carded five birdies in his opening round to sit alongside American Jim Furyk. New Zealander Lee shot seven birdies and two bogeys for a five under 65. Former US Open champion McDowell started the year ranked 20th in the world but has now slipped to 60th. "It's been a rough year, no doubt about it," he said. "I've just been working hard on the game and trying to find a direction forward. I feel like I'm starting to do that now, and it's just a case of shooting some numbers and getting the confidence back a little bit." England's Justin Rose had been four under after six holes but finished with a 67, leaving him two shots off the lead alongside Scottish Open winner Rickie Fowler. Fellow Englishmen Paul Casey, Lee Westwood and Ian Poulter are a shot behind, alongside Victor Dubuisson and Henrik Stenson. Masters and US Open champion Jordan Spieth, who would replace Rory McIlroy as world number one with a victory on Sunday, finished his first round with a level-par 70.